My all-time favorite handgun is the Smith & Wesson Model 52 target pistol. I love its clean lines, grip that is perfect for me, light trigger pull and excellent sights. I purchased my Model 52 in 1979, roughly 18 years after its introduction. In History of Smith & Wesson, author Roy Jinks notes production was slow due to the fact tolerances within the gun were tighter than regular production guns. In fact, so slow that in the first year of production only 90 pistols were made. The gun got its excellent grip frame from the Model 39, and initially the lockwork of its double-action trigger came from the Model 39 as well. That did not sit well with competitive shooters, so Smith & Wesson redesigned the trigger as a crisp single-action-only and designated the gun as a Model 52-1 to indicate the modification. 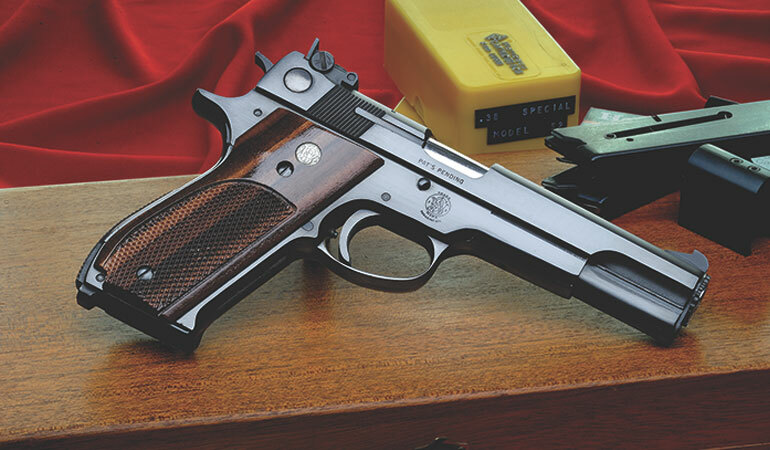 My gun is a Model 52-2, which incorporated a change to a coil-spring extractor—another Model 39 feature. The Model 52 is one handsome gun. The fit and finish are superb, the polishing is above reproach, and the bluing is rich and deep. The polishing on this gun is done to perfection—especially on hard-to-reach areas like the inside and outside of the trigger guard where it meets the frame; the backstrap, to include the base of the beavertail; and within and around the cast on checkering. The target sights are of the highest caliber, with a rear notch perfectly cut to ensure a good sight picture over the long sight radius to the front sight blade. The sights can be adjusted with a coin. The gun has a novel barrel bushing that, with the aid of a special included tool, allowed the shooter tighten or loosen the bushing to tune it for accuracy. The barrel itself has a hard-chromed “ball” of sorts at the end that fits within the bushing, and it eliminates wobble and friction. Precise camming at the rear of the barrel results in a tight lockup, and the polished feed ramp provides flawless feeding. I found the gun’s balance to be a bit light for me, but Smith & Wesson included a weight that slips right over the frame to add a few ounces. I also customized my gun with a set of Goncalo Alves grip panels, and I bought an empty S&W presentation case that I redesigned with a custom insert to hold the gun, spare magazines and the barrel wrench. Smith & Wesson took one gun and tested it with more than 100,000 rounds of lead bullet ammo without it showing any appreciable wear. 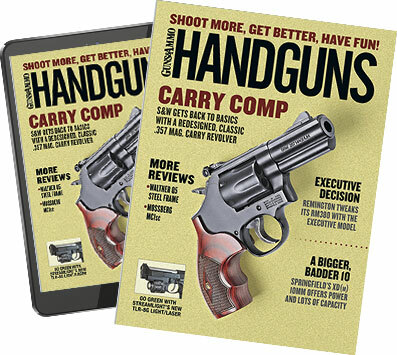 I fire flush-seated 1480 wadcutter handloads through mine, and it shoots like a dream. After nearly four decades in my possession, it’s still my favorite handgun.